Another estate find. 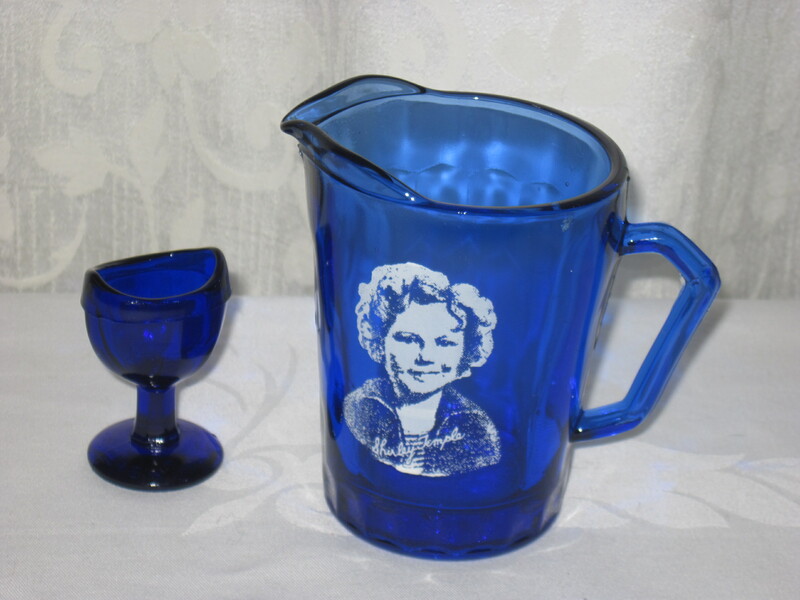 Shirley Temple cobalt blue creamer dates to the late 30’s . The cobalt glass eyewash cup is probaby from the same era. Most baby boomers and their parents would remember Shirley Temple’s movies from that era. Found these at the thrift store yesterday. I have no idea if they are old or new, valuable or not, but they appealed to me so I bought them. 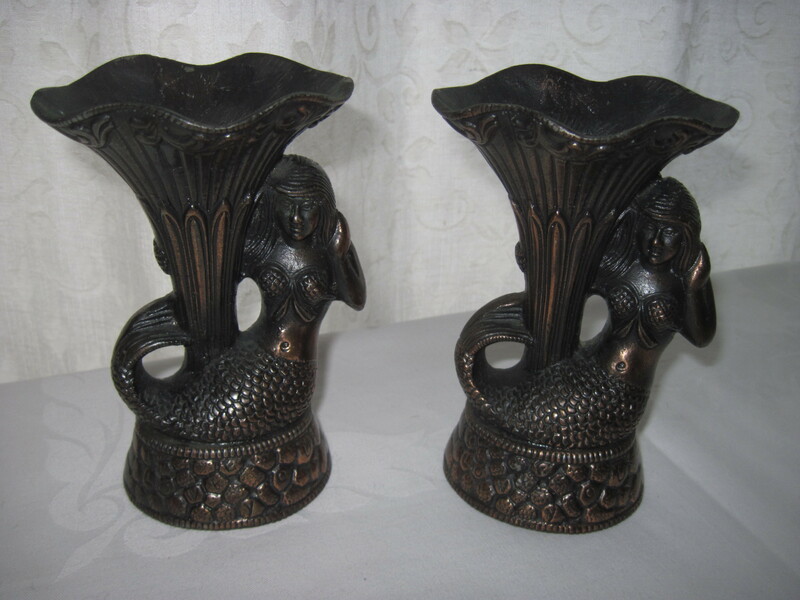 They are made of some kind of cast metal with a bronzed paint finish. They may be for candles or perhaps just ornamental. If anyone has any information on these, I would love to hear from them. These are some of my finds this week. The retro turquoise lamp with an asian inspired ceramic base is my favourite one of the bunch. This was from an auction I attended and much to my surprise I was the only bidder. It is straight out of the 50’s. 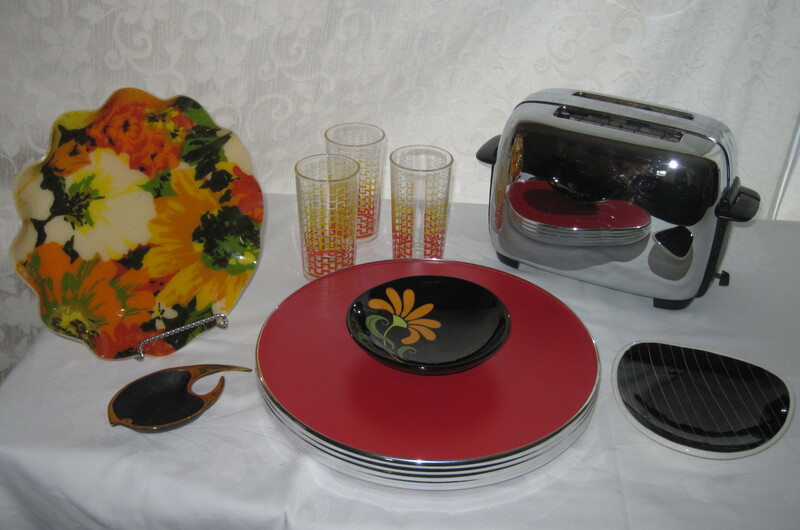 The yellow melmac platter and bowl were made in Buckingham Quebec, Canada; the turquoise melmac lug bowls are also Canadian made and are ca. 1950’s. 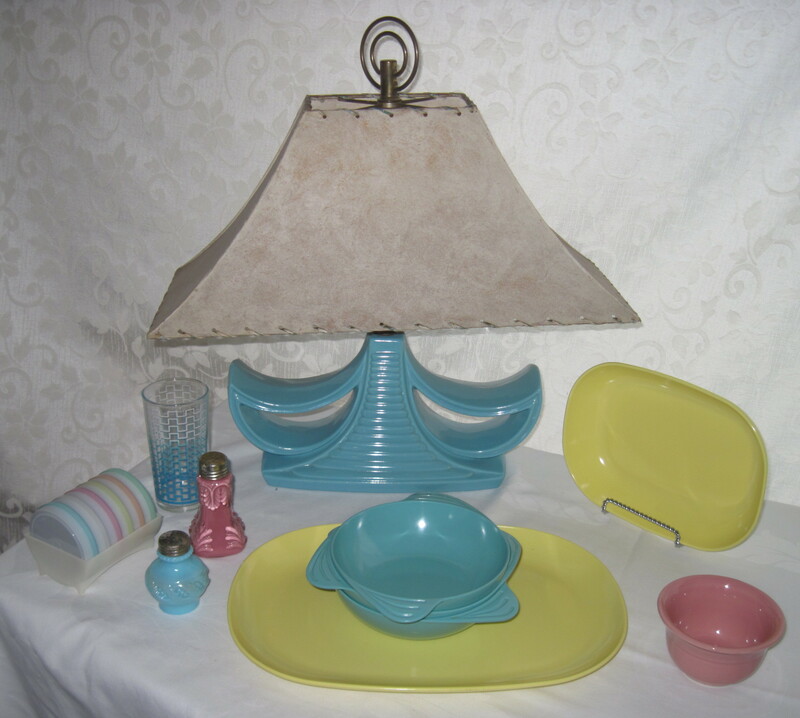 The pink cased glass shaker and turquoise milk glass shaker are probably ca 40’s. I found some Tupperware coasters in complementary pastel shades and a pink Fiesta Ware Ramekin which I think is from the 80’s. The glass is by Dominion Glass Co. of Canada, ca 1950’s. All the items other than the lamp were found at my local thrift stores and an estate sale this past weekend. 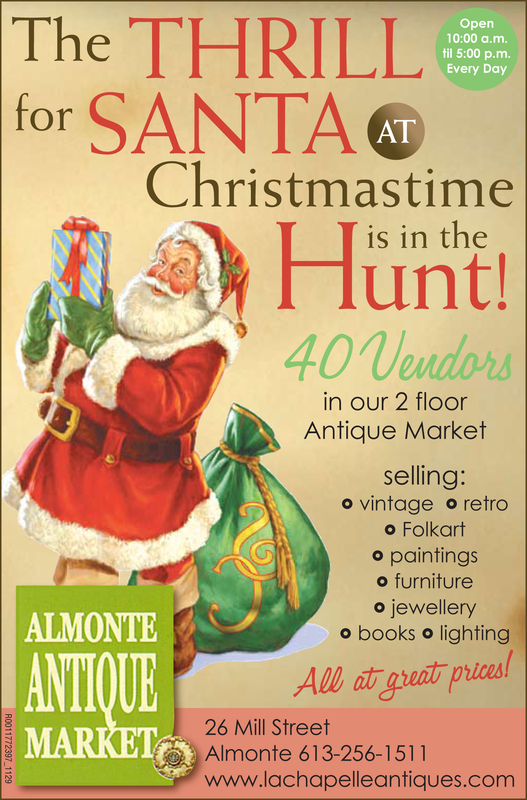 Please note that most of these items are now SOLD!! 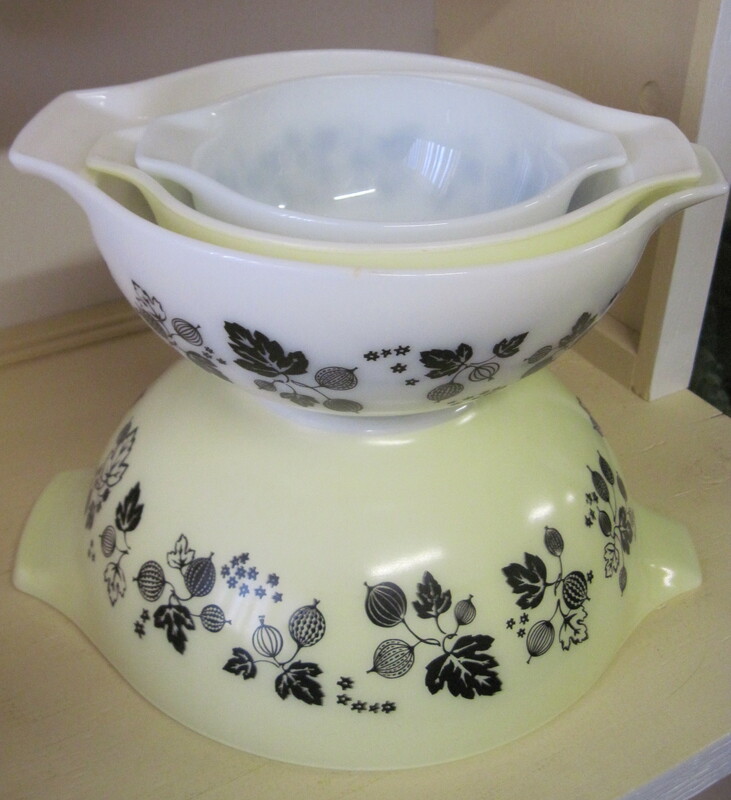 These two covered onion soup bowls were manufactured in the 50’s by La Laurentienne (Laurentian) Pottery in St. Jerome, Quebec. One still has it’s original tag! They are in pristine condition, never having been used. Laurentian Pottery was in business from the early 1930’s to 2005 I believe. 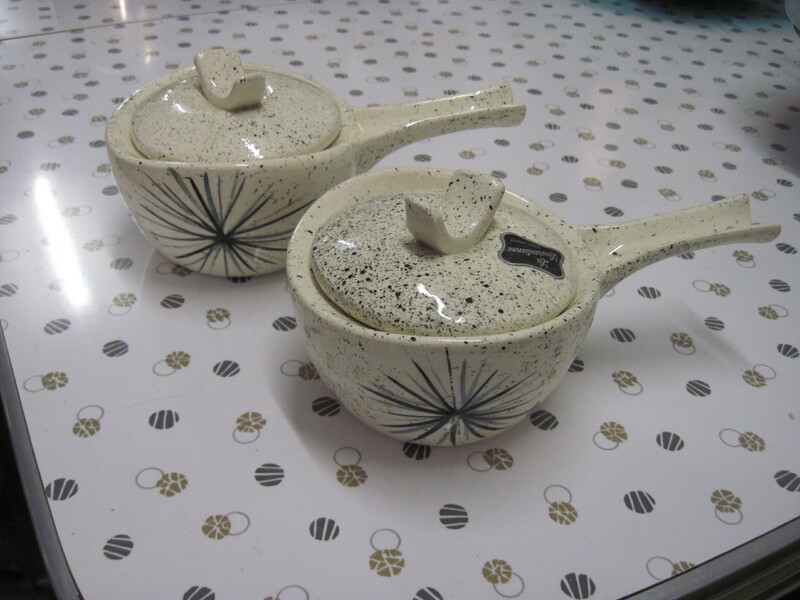 These have a wonderful atomic star burst design in blue and black on a speckled background, popular in the 50’s, with a unique styled handle on the lid. Don’t they look great on the retro chrome table! I found them at a local thrift store this week.